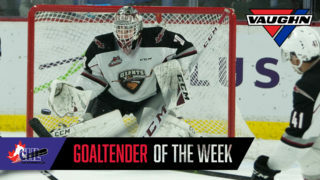 he Vancouver Giants (30-12-2-0) matched their season-long winning streak and did so against the top team in the country. 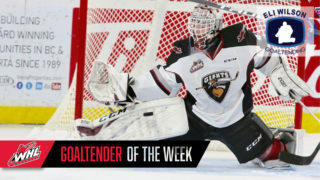 Thursday night in front of over 4000-strong the Vancouver Giants earned a hard-fought 3-1 home victory over the Prince Albert Raiders (40-6-0-2). Davis Koch scored twice for the Giants, extending his point-streak to seven games and his goal-scoring streak to six games in the process. Brayden Watts added a second period marker for the G-Men who got 31 saves from draft eligible goaltender Trent Miner. Prince Albert’s lone goal came late in the third period from captain Brayden Pachal. For the Giants it was their fifth straight home victory. VAN – Off a terrific Trent Miner save at one end, back came the Giants on an odd-man rush. Milos Roman fed a pass to Brayden Watts in the high slot, and the California native did the rest, wiring home his 11th of the season past Ian Scott’s left pad to give the Giants the 1-0 lead. His goal came at 13:15. VAN – Davis Koch extended the Giants lead to 2-0 on a breakaway at 8:37. Lukas Svejkovsky and Tristen Nielsen earned assists as Koch extended his point streak and goal-scoring streak with his 17th of the season. PA – The Raiders finally got on the board at 18:32 of the third period when captain Brayden Pachal (12) let a shot go from the right point that switched directions and snuck past Trent Miner. Pachal’s goal was assisted by Kaiden Guhle. 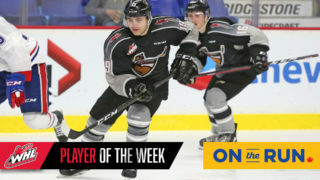 VAN – Davis Koch ended all hopes of a Raider comeback exactly one minute later when he backhanded his 18th goal of the season into the empty net, securing the Giants 30th win of the season. Next Giant Game: Saturday on Kelowna at 7:05 PM. 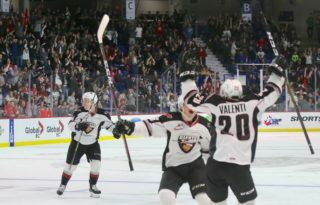 The Vancouver Giants went a perfect 6-0 this season against Eastern Division teams following Thursday’s win over the Raiders. Davis Koch has scored in each of his past six games, and has seven total goals in that span. His point streak was extended to seven games. During that span he’s notched seven goals and nine assists for 16 points. With the win, Trent Miner’s save percentage improved to .933 and his goals-against-average improved to 1.86. He trails only Prince Albert’s Ian Scott in both categories. The Giants have arrived at the 30-win mark 12 games faster than they did a season ago. Last season through 44 games the Giants were 24-14-4-2. With their seventh straight win the Giants have matched their season’s longest winning streak. They’ll look to extend it to eight on Saturday night in Kelowna.